So if you or anyone you know has ever wanted to put their streetcar onto the Killarney main straight this is the perfect opportunity. • Entries (main gate caravan – times above) – show SA Drivers license and complete required paperwork / indemnity. R20 admin fee to participate on the track, this excludes your ticket to get into the facility. • Vehicle check (go around Turn 5 and turn right into back of scrutineering building) – all wheel bolts required, battery must be fastened down properly and everything must be in general good working order. Required safety gear include long pants & top, closed shoes and SABS approved type crash helmet. • NOTE: Always drive slowly on the access roads and circuit while not participating. • Vehicles that have run quicker than a 13 second run are not permitted at Street2Strip events for safety reasons. The idea of the Street2Strip events is to provide the facility at a nominal fee to street racers who are racing in and around Cape Town. As there will be no formal competition and this is aimed purely at the Street racers, no competition license will be required however indemnities will have to be completed. The timing lights will be in place however there will be no results posted nor prizes awarded at the end of the evening. This event is aimed specifically at the streetcar street racers with RSA driver’s licenses. So with that in mind there will be no motorcycles on the evening, no interruptions from the Club drag competitors, just a queue of streetcars wanting to take one another on down the strip. As we are planning to have many more of these types of events we are aware of noise pollution laws, we will not allow any vehicle even moderately too loud after 9pm. This includes some drifting practice at the oval side of the circuit when approved to run. So if you have an after-market exhaust, don’t worry unless it is very noisy. Straight through exhaust will have a problem so please do be aware of the situation. If the first MSA Drag racing event of 2011 was anything to go by, the coming weekends racing will be an event to be remembered. The entry for the MSA competition catered for over 40 Club competitors during the day and 200 Streetracing competitors in the evening for the Street2Strip. The Oval side of the circuit will once again host Short Circuit motorcycle racing till late afternoon while the Drag strip runs from 9am till about 5pm. MSA Entries will be accepted at the main gate caravan from 7.30am till 9.30am, MSA licence applications can be completed with Paul Simon at the same time. The 2011 Club licence fee is R350 for the year, valid till the 31st December 2011. More info below. Raceweb.co.za Online Magazine will be hosting the Street2Strip side of the event and will be adding some interesting flavor to the evening. Be seen, be heard, be famous! Show us what you got and be featured in Raceweb.co.za Online Magazine for all to see. Their scouts will be prowling Killarney to find new talent, from hot cars and bikes to potential models. 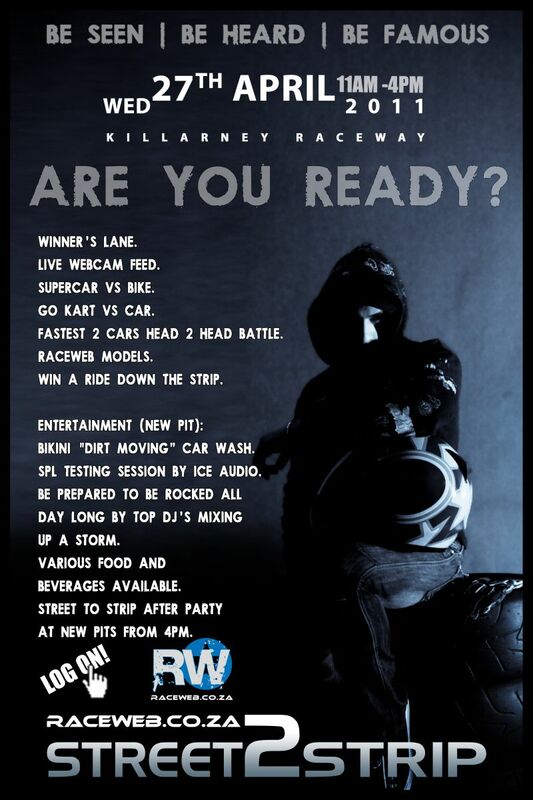 If you think you have what it takes to be in the magazine or maybe even make the cover, be sure to get yourselves down to the Killarney Raceway! If you think you’re fast, show us what you’ve got! Enter into the “Winners lane” slot where racers race in their lane until beaten! You might even make it to the end of the night where the fastest two cars of the event go head to head in a battle for top honours, fame and glory! In addition, the first 50 race entries receive a free Raceweb.co.za Multimedia DVD. Have you always wanted to know what it feels like to line up at the starting lights, warm up the tyres, launch and fly down the strip? A mystery car will be dragging down the strip and if you can guess its quarter mile time correctly, you stand a chance of winning a shotgun ride down the strip to experience that very same feeling! Ever seen a go kart smoke its rear tyres and do donuts or power slides? Kenilworth Karting will be providing performance go kart exhibitions with their 125cc six speed superkart! Can this little pocket rocket break the sub 13 second barrier? Who knows? You have to see this for yourself! As always Raceweb.co.za will be attending with their gorgeous models, so if you want to get a glance at these beauties or get a pic with them, make sure you get your behind to Killarney Raceway. D-Evo will be hanging their 1-10 scale drift machines sideways at the new pit complex while sound enthusiasts can enter an SPL testing session hosted by ICE Audio. (More info: Matthew – 071 879 5011). Be sure to make your way down to the new pits to see some of Cape Town’s hottest cars and clubs on display. For those who are going to be out of town and still want to see what’s happening, don’t worry, there will be a live webcam feed from the event so you can see who’s lining up with who and what’s going on. All they have to do is log on to Raceweb.co.za and check it out from there. Be sure not to miss out on this one of a kind Street2Strip, pioneered and presented by Raceweb.co.za Online Magazine. Be seen, be heard, be famous! Street2Strip racing action will take place after the MSA Drags on Saturday from about 6pm till 10pm (as per normal the S2S event will be four hours). S2S Entries will also be at the main gate on Saturday from 5pm till 7pm, excluding the entry ticket the admin fee for S2S is the normal R20 per driver. More S2S info below. Admission for Saturday is R40pp from 8am till 4.30pm where the price will revert back to normal S2S prices of R30pp.